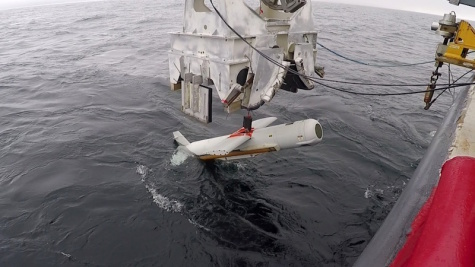 PANAMA CITY, Florida --- After completing Developmental Testing (DT) in February of 2019, the U.S. Navy is another step closer to delivering the AN/AQS-20C (Q-20C) towed minehunting sonar to the Fleet. The Q-20C has advanced acoustic and electro-optic sensing capabilities that will detect, localize and classify bottom, close-tethered, moored, and volume-moored mines. According to Naval Surface Warfare Center Panama City Division’s (NSWC PCD) Q-20C Lead Project Engineer Joe Thomas, the Q-20 C variant has increased capabilities, particularly with regard to searching in multiple modes in the water column. NSWC PCD is considered the nation’s premier technical center for Mine Warfare and Mine Countermeasures (MCM). NSWC PCD’s subject matter experts partnered with Q-20C post mission analysis (PMA) operators during this phase of DT to evaluate the system performance with these latest improvements. Thomas said the improvements implemented into the C-variant ready the system to be integrated with its intended tow platform, the MCM Unmanned Surface Vehicle (MCM USV) in Fiscal Year 2020. Designated on Oct. 8, 2018 as a Program of Record, the MCM USV is a long endurance, semi-autonomous, diesel-powered, all-aluminum surface craft that supports the employment of various MCM payloads. Thomas reported the PMA operators’ input and recommendations would be reviewed by the technical team for incorporation into the Q-20C for further evaluation and ultimately be useful for the system’s integration with the Fleet Users in MCM. “We’re excited to finally finish Developmental Testing after the ‘pause’ caused by Hurricane Michael. This test marks a major milestone in delivering this capability to the Fleet” said Thomas. PMA operators Aerographer’s Mate Chief Petty Officer Larry Pacquer and Mineman Petty Officer First Class Jonathan Roden reported an equally optimistic outlook for the Q-20C’s potential Future Naval Capabilities. “As part of the Littoral Combat Ship’s MCM Mission Package, this sensor, when deployed by the MCM USV, can help to clear minefields,” said Pacquer.